City: Santa Marta Country: Colombia Loan Use: To stock the business and offer more products to her clients. Ana Isabel Ortega is a hardworking, loving grandmother who lives in Santa Marta, Colombia with her son, daughter-in-law and her two grandchildren. As a single mother, Ana Isabel has always put her needs and dreams behind those of her family. Then, a few years ago, she decided to pursue her dreams of opening her own hardware store; however, this endeavor had its fair share of hardships. In fact, there was a time when she didn’t think she would be able to sustain the business and the needs of her family and was at risk of closing the shop. Everything began to change when a friend encouraged Ana Isabel to join Opportunity International. 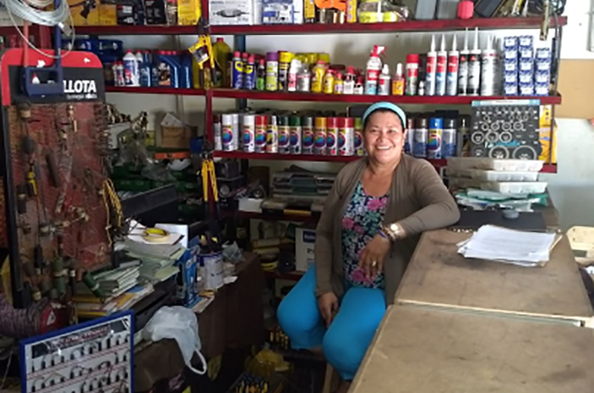 Ana Isabel received financial training and a loan to purchase inventory in bulk. With more tools and hardware to sell and a greater diversity of products, she was able to attract new customers and increase her sales. Down the road, Ana Isabel plans on saving up enough money to build a house of her own. Thanks to her loan, Ana Isabel can now continue to grow her business, while ensuring her children and grandchildren receive an improved quality of life.